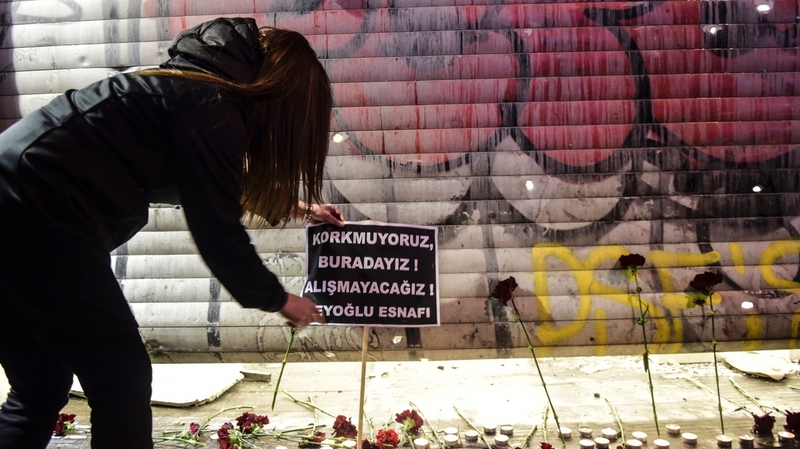 Turkish Interior Minister Says Istanbul Suicide Bomber Was ISIS Member : The Two-Way Efkan Ala said Sunday that the attacker who struck Istanbul on Saturday was a Turkish-born member of ISIS. Four victims died in the blast: three Israelis or Israeli-Americans and one Iranian. A woman puts a placard at the site of a blast on Istiklal Street, a major shopping and tourist district, in central Istanbul, on Saturday. The sign reads in Turkish, "We are not afraid, we are here, we won't adjust," according to an AFP translation. A deadly explosion in central Istanbul on Saturday was the work of a Turkish-born member of ISIS, Turkey's interior minister announced Sunday. Interior Minister Efkan Ala said that Turkish authorities have identified the attacker as Mehmet Ozturk, a 24-year-old man who was a member of the Islamic State. The blast killed four victims — three Israelis and an Iranian — in addition to the attacker. Two of the Israeli citizens had dual citizenship with the United States. A spokesman for the National Security Council confirmed the American deaths and denounced "the evil of terrorism." Dozens of people were wounded in the attack, including several Israelis who have been flown back to Israel. "Israel has lodged a complaint with Turkey over a tweet by an official at a local office of Turkey's ruling party. The official wrote that she hoped the wounded Israelis had died. "Israel's Prime Minister says he demanded steps be taken against the official. Her tweet was removed, and Turkish media said she would be expelled from the party. Israel and Turkey have been working to normalize the rocky relations between the two countries." As we reported yesterday, Saturday's blast targeted Istiklal Street, a popular pedestrian area packed with shops and restaurants. Dalia Mortada, reporting from Istanbul, tells our Newscast unit this is the second attack in Istanbul this year which was allegedly committed by a member of ISIS — an explosion in a tourist neighborhood in Istanbul killed at least 10 people in January. The attack also came less than a week after a car bomb in Ankara killed more than three dozen people; that bombing was claimed by Kurdish militants.